Haus Arton: Ferienwohnungen und Festräume am Werbellinsee | Welcome! Located in the middle of the Schorfheide region by the lake Werbellinsee, one of the most beautiful parts of Brandenburg state. Beautiful individually furnished holiday apartments and holiday rooms, some with a view of the lake, offer ideal conditions for relaxation in any season. Our holiday complex with two sun terraces to the courtyard and garden and with direct access to the Werbellinsee promenade is the ideal setting for your projects and family festivals. Dramatic weather games and romantic sunsets over the Werbellinsee, a camp fire in the garden, starry nights and the unique game of the Schorfheide will make your stay unforgettable. We are looking forward to your visit! Our resort is often used for concerts, workshops, exhibitions and family celebrations. Whether dance classes, choir week, yoga groups or corporate seminars, a large wooden-floor hall, equipped with a projector and sound system, offers enough space for all. And if that's not enough, we still have terraces, a courtyard and garden. Free WiFi. Walks and day trips throughout the unique Schorfheide-Chorin biosphere reserve, swimming, fishing, diving, horse-riding and boating are just some of the possibilities. In our beautiful garden with view to the Werbellinsee, on the terraces, porches, balconies or in our private sauna you can simply let the soul "unwind". 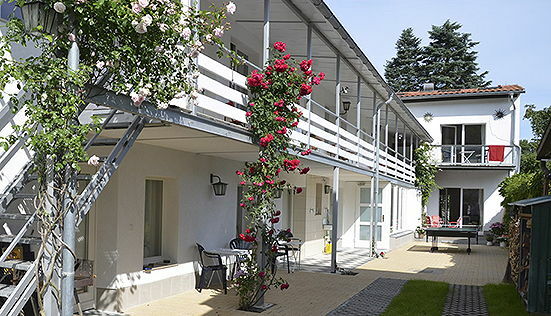 haus arton® in Altenhof is located only a 40-minute drive from central Berlin, with direct access to the Werbellinsee promenade and beach, boat dock, restaurants and beach bars. Daily fresh bread and amenities from the village shop are just 70 meters away.